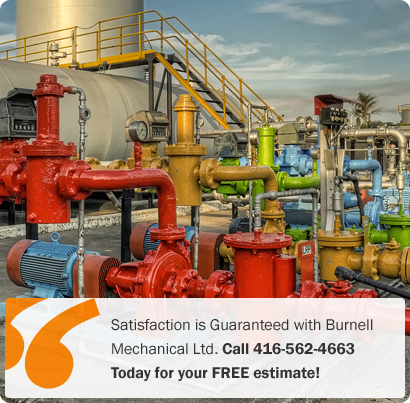 Burnell Mechanical Ltd. has the best Toronto mechanical technicians ready to assist you with process piping consultation, sales, installation, and repair. We specialize in industrial plumbing design & build and ability to install continuous lengths of 'a variety of process conveying equipment' of over 200' long x 14' wide. Burnell Mechanical Ltd. offers prompt, knowledgeable service for industrial and commercial spaces in Toronto and the GTA. Our Toronto mechanical technicians are available around the clock, including after hours in case of emergency. Call 416-562-4663 today for your FREE consultation! Copyright © 2013 Burnell Mechanical Limited | All rights reserved.